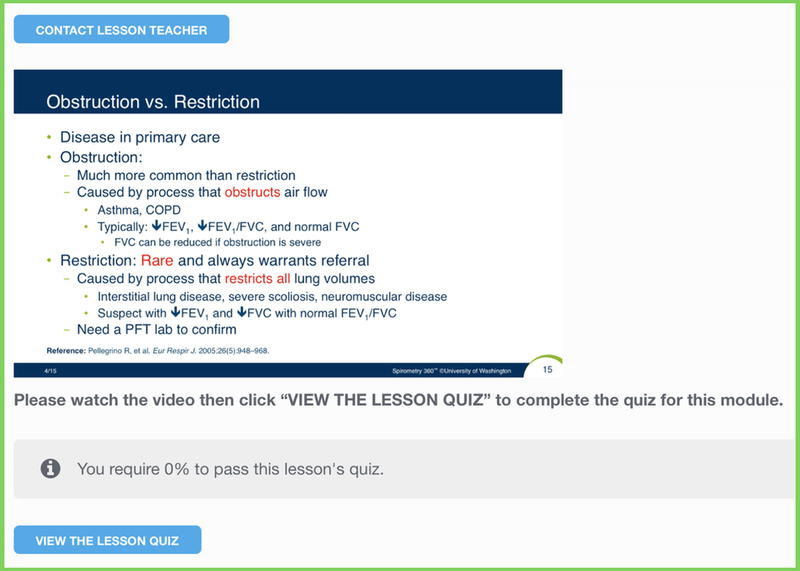 A self-paced online instructional program that provides a clear and basic primer on how to perform and interpret spirometry tests. A self-paced online course series developed by our expert faculty that provides comprehensive instruction for performing, interpreting, and implementing spirometry in primary care. These case-based courses target both test administrators and interpreting providers. Personalized analysis of your spirometry tests though customized monthly feedback reports written by our faculty. Access your spirometry test file in our Feedback Reporting System to review each test along with its grade and faculty comments. One on one support for technique and interpreation is also available. Demonstrate sustained improvement in the number of spirometry tests submitted per month. Demonstrate sustained improvement in the quality of spirometry tests as compared to baseline data for practices so at least two-thirds of sessions meet American Thoracic Society (ATS) acceptability criteria. Learn to integrate diagnostic spirometry into a planned-care model. Prior to training, your team submits one set of spirometry tests for review in order to establish your Baseline (required for MOC-4 credit). Once we receive your Baseline tests, your team is given access to Spirometry Fundamentals and the Spirometry Self-Paced Learning Labs. For the remainder of the course, your team receives 5 personalized monthly Feedback Reports based on your spirometry tests (1 baseline and 4 post-training) and access to your test file in the Feedback Reporting System.